If you are a farmer in the winter rainfall areas (Western Cape) then we hope that you have been able to harvest your crops without too much damage from wind or rain. If you are in the summer rainfall areas, then we hope you have been able to plant your next crop successfully and that the potential for a good crop is there. One of the biggest challenges that we are facing as farmers is the profitability of grain farming – the cost of the inputs keeps rising and yet the price of the grain we produce does not rise sufficiently to make our efforts profitable. This is a challenge to all farmers, subsistence, smallholder, developing and commercial farmers. In order to survive, we have to become ever more efficient – we need to keep our costs as low as possible, while at the same time, we need to increase our yields and ensure that we get a good price for what we have produced. It is not easy. As farmers though we are blessed because whatever happens in the world, people need food to eat and clothes to wear and we are the producers of those items – they simply cannot do without us. Thinking creatively is necessary – what can we grow that people are prepared to buy at a price that enables us to keep farming? Are there perhaps other crops that we can consider growing that will enable us to diversify our risk? It is more comfortable to keep on doing what we have always done – but if we do that, we will get the same result. We need to look around us to see what our local community members need, what our national markets require, and then even, what the international markets are demanding. Once we know what we can sell, then we need to concentrate on how to grow that and make a profit. The motive of profit is essential because without making profits, we will not be able to continue farming. 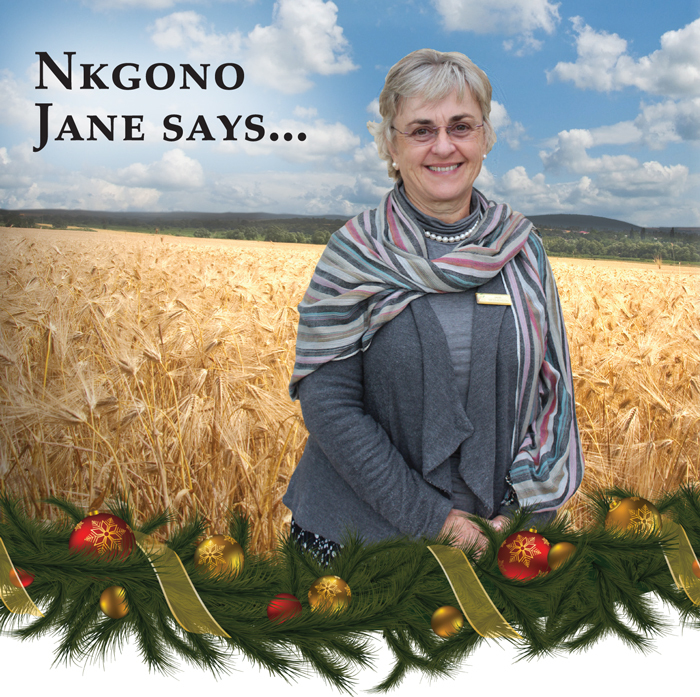 In South Africa, our Christmas holidays coincide with the busiest time of the year for the summer crop farmers (maize, sunflowers, groundnuts, soybeans) – we cannot stop working to enjoy the holiday season. This time of year, demands our full attention – scouting for weeds and pests, spraying for weeds, applying top dressing, replanting crops (if required). If we do not use this time well, we will not get an opportunity again for another full year. For those of you who have planned your activities well, you might be able to take a little time to rest and enjoy family time. As the Grain SA Farmer Development Team – we wish you a very blessed Christmas season and Good Wishes for 2019. Be Blessed.